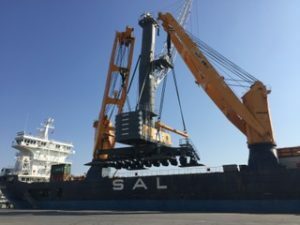 The international port trading company PORTSSOLUTIONS has delivered a Liebherr LHM 550 mobile harbour crane from the port of Bata in Guinea Equatorial to the stevedoring company GMS in the port of Sfax in Tunisia. This crane is the biggest Mobile Harbour Crane in the country of Tunisia and in North Africa. Sfax is located at the center of the Mediterranean coast line of Tunisia, 270 km southeast of the capital Tunis and is considered to be the center of the industrial area of the country. The multipurpose port of Sfax is the second biggest port in the country. Its main traffic consists of dry bulk (phosphate and by-products, sea salt, cereals), but shipping lines like Maersk and CMA CGM also have regular container services to Sfax. On 10 May 2018, the second-hand Liebherr Mobile Harbour Crane model LHM 550 was added to the port’s current equipment fleet. With not more than 500 working hours, the crane is in a good condition. It is a high-speed machine offering hoisting speeds of up to 120 m/min and 54m maximum radius, enabling to handle vessels of up to 18 container rows. With the new crane the GMS stevedoring company increases container handling speed and operational safety. This crane is equipped with a first-class twin lift spreader Bromma EH 170 which will increase their turnover when working with 20-foot containers on top. Carlos Kohler from PORTSSOLUTIONS says that similar cranes in equal circumstances are able to exceed 30 containers per hour or more. The crane was shipped fully erected from the port of Bata in Guinea Equatorial to the port of Sfax. The journey took about two weeks with the heavy lift carrier MV Amoenitas from SAL. The very professional and proactive captain and crew members completed the loading / unloading operation in just three hours.